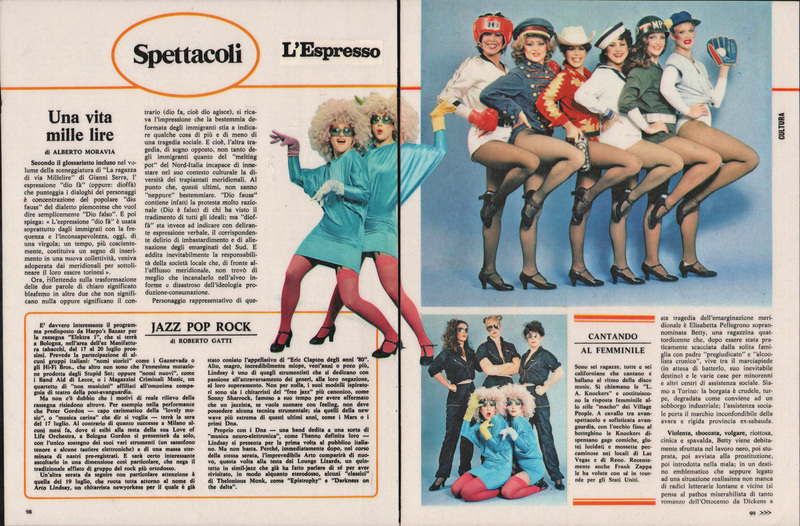 And here is a published layout in the Italian Weekly L’Espresso from 1981. They are 6 girls, all of them from California, they sing at dance at the rhythm of disco music. They are called the L.A. Knockers and they represent the female response to the macho style of the Village People. A cross between vaudeville and sophisticated avant-garde, with an an eye on the box-office, the Knockers deliver comic gags, shiny glutes and sinful moves in the clubs of Las Vegas and Reno. Recently even Frank Zappa wanted them to tour with him across the United States.